This is a Sponsored post written by me on behalf of GFI for SocialSpark. All opinions are 100% mine. I first encountered the folks from Vipre Antivirus at a Microsoft Tech Ed event several years ago. I had always thought that they had an interesting, innovative product, but had thought they ony marketed to corporate clients. It turns out, that's not the case, as I had recently had the opportunity to test out Vipre Antivirus on my home PC. The first thing I noticed was how easy it was to install. It's a smooth, quick, no-fuss installation which is quite a welcome change from other packages I've used in the past such as McAfee and Symantec. Vipre Antivirus has all of the antivirus program features that a modern security program should contain, including antivirus and antispyware protection. And Vipre doesn’t just protect your computer from viruses and spyware, but it also removes rootkits, trojans, worms, keyloggers, dialers, adware, script kiddies, and many more types of malware. Vipre's advanced heuristic technologies dynamically locate malware on your computer before it even has the chance to cause any problems. And, unlike other virus programs I have used, Vipre has a very efficient scanning engine that is free of unnecessary bloat and memory leakage. It has a light footprint so your computer won't seize up while Vipre is running. To top it all off, Vipre’s antivirus software is exceedingly simple to use. Setting specific scans on a schedule or adjusting settings are a breeze. Best of all, if you do run into a problem with Vipre, they offer free US based customer support. Although most common issues can be fixed by consulting the Vipre Knowledge Base, user guide or support forums, you can contact the service department through email, phone, or online chat if you'd prefer. Don't just take my word for it, folks. 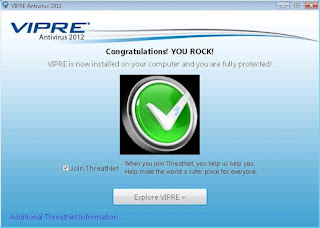 Try Vipre Antivirus yourself. Check out their Facebook page at http://www.facebook.com/GFIVIPREAntivirus or visit them at vipreantivirus.com for more information. Pushing Up Against The Big 40.